I told ya I'd be back with another tag and here I am! This one uses the same butterflies as Tim used (in the original size- trimmed by hand... not too painful!) and another stencil from my prize pack from MMMC :) I wasn't crazy about how this one turned out at first, but once I got my layers added I was happier with it. I rubbed some Distress Stickles on the butterfly wings for a bit of sparkle. Love this stuff- pretty bummed that it seems to have been discontinued! I may have to beg & plead with Tim & Ranger to at least bring the rock candy color back! I think this is pumice stone I used here. If you see it on sale somewhere... snag it while you can! Here's a look at this bow. I somehow over blended my inks on this... forgetting that the blue & yellow I used mixed together to make green LOL good thing I love the color! That's a really beautiful take on the June tag - I love the colours, they're right up my street! 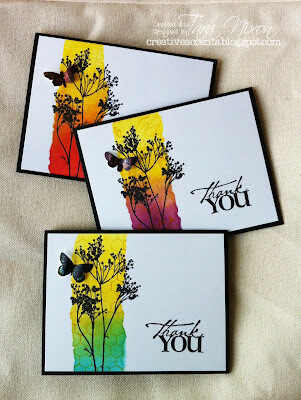 LOVE your colors in the background, and your stenciling came out perfect! Gorgeous butterflies too!!!! Amazing tag! LOVE the colors and the butterflies are awesome! !